Long and soft curls are in style today. Many celebrities are showing off their magnificent curls. Drew Barrymore, pictured at left, is wearing a great curly long hair style that is just the right shade of hair color. To create this style on your own, apply a styling cream or curl-enhancing cream throughout your hair. Blow dry the hair using a diffuser attachment and your fingers to shape the hair. If you do not have naturally curly hair, you may need to add soft waves throughout using a curling iron. Spray the hair with some shine serum and/or finishing spray to make the hair appear extra shiny! 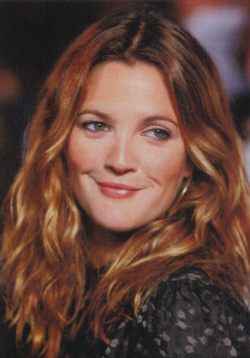 Click here for more photos of Drew Barrymore Hair Styles. It seems that we are a little bit behind in listing the best celebrity hair styles selected every week. So, here is a list of all the recent styles selected and the dates.